As we do temple work, we develop a spiritual kinship with our Heavenly Father and our Lord and Savior Jesus Christ that brings us peace, happiness, and eternal joy. We know that temples are to be a refuge from the storm (see Isaiah 4:6). I testify that they really are. I feel the spirit there, and an overwhelming peace that comforts me and helps me put into focus the daily ongoings of my life. It truly is a house of God. Glad to hear that you have a place that recharges your spiritual batteries and gives you peace. 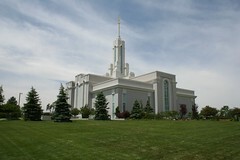 I’ve always been interested in LDS temples. Needless to say, I will never have the opportunity to experience them firsthand. I did attend marriages of friends who married in the temple. It was an odd experience not being able to see beloved friends get married. However, I understood and respected the fact that they are not open to the public. Actually, they aren’t even open to every LDS person. The concept of eternal marriage is so unique to the Mormons. It’s a beautiful thought to believe that families will never be separated. I often see the Oakland Temple from the highway at night. It’s illuminated very beautifully and adds to the Oakland Hills skyline. It is often visited by tourists in the area, and they do have beautiful concerts during the warmer months. But as a non-LDS person, I wou.ld never want to happen to their temples that has happened to the National Cathedral in Washington, or the cathedrals in Europe. Tourists are snapping pictures at the time the priest is elevating the host. They have ceased to be spiritual centers for the community and have become tourist attractions. Weddings are celebrations that traditionally happen at the altar in my church. I always had a feeling that snapping pictures and videotaping the moment the priest elevates the host as unbelievably disrespectful. I’m unfamiliar with what the “host” is that the priest elavates? Does he lift the groom on his shoulders or something? :) Just kidding.. but could you explain what that procedure entails? I understand how you felt with not being able to be present at your friends’ weddings (we call them “sealings”). I have some friends and family who have married people whose parents were not members, or not active members, of our church, and they too could not be present. I can’t imagine how hard that would be. In some cases, the couple held a “ring ceremony” that night as part of the reception in order for those parents to be able to participate a little and include them in the day’s special events. The temple is amazing. Being able to make such important covenants with the Lord reassures me that it’s why I’m here, and what I need to do. My patriarchal blessing talks a lot about the importance of the temple, stressing its importance. I think we’re up to 122 of them throughout the world, with more being constructed each year. Amazing. The “host” is the bread the priest consecrates during the Liturgy of the Eucharist (Communion). It’s an extremely holy moment. At that time, the members are kneeling.